“Shiki” began as a novel written by Fuyumi Oni, whose chief claim to fame is writing the “Twelve Kingdoms” novels. (I have yet to read these, but I am told they are very interesting. I am aware of some Tokyopop translations as well.) Shiki has now become an anime from studio “Anime no Chikara” (“The Power of Anime”) and is currently airing in Japan. The word shiki itself is spelled with two kanji: corpse + fiend. (The kanji for the latter is used for the Japanese native word oni, but my years of experience tell me that “fiend” is a good way to read it for its broader, less limited meaning.) The “shiki” in this show are vampires, but not traditional Dracula vampires. The show is centered on a sleepy mountain village (keep in mind that a “village” can still include a fair number of people!) that is being visited by death. At first, this is believed by the village’s practicing doctor to be the result of a contagious illness, but the truth is more insidious: some of the recently killed are rising as vampires themselves and are being unleashed on the unsuspecting population. The show has the air of a medical murder mystery about it, dovetailing into a supernatural conspiracy. 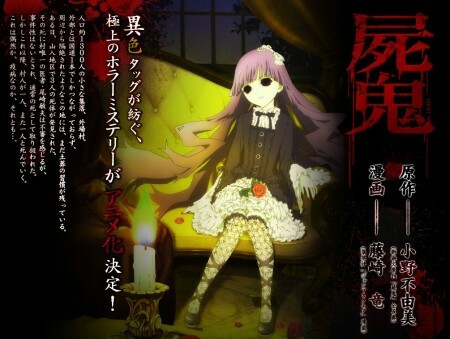 The key to the show seems to be a little girl who is clearly not “human,” the daughter of a wealthy couple whose mountain estate seems to be Vampire Central. A young adult son is the public face of the family, moving around in broad daylight in spite of coming off as clearly a vampire himself. A feeling of creeping doom. Visceral energy from the characters’ own perspectives. Plot being doled out in small pieces. A lot of visual detail/ high production values. Here’s something to note: this series has the self-confidence to start slowly. It’s assuming we have some reason to be interested in it and that we are looking for real drama, seeing the world from the characters’ own eyes and experiencing their horror at discovering a “real-life” (to them) infusion of the supernatural in a world where it clearly is not expected. Indeed, since no one sane would believe such a thing is possible in “reality,” it seems evident that teenagers will be the ones to fully awaken to the threat and attempt to deal with it, without the benefit of special powers. Not a cool place to be! How will it end? Here’ s the good part: I have no idea based on eight episodes of the show. How did the first vampires start here? Why are they threatening to wipe the whole village out? Why now? Won’t they starve after? What’s the deal with the girl? Will the village simply cease to exist? Well, that’s as far as I want to go without going over anything that might be considered spoilers. Bottom line? I’m interested. There’s also… what I’ll call the “real people factor,” when people who aren’t super-heroes are trying to tackle problems that aren’t sane to begin with. That’s what makes this a drama, not an action film. For that reason, it is all the more interesting. This entry was posted in Anime, Culture, Japan, Japanese and tagged anime, culture, Japan, Japanese, Manga, novels. Bookmark the permalink.